Greetings Beaders, Leah here from Eureka Crystal Beads! I’m excited to bring you the 8th installment of 12: Birthstones! At the beginning of each month I’ll bring you a blog that is chock-full of everything you might want to know about that month’s stone. Were you born this month? If so, you might take particular interest in my eighth blog in this series: TURQUOISE, the birthstone for December. Turquoise is an opaque blue-to-green mineral that is a hydrated phosphate of copper and aluminium. It’s rare and valuable in finer grades and has been prized as a gemstone and ornamental stone for thousands of years due to its unique hue. In recent times, Turquoise has been devalued, like most other opaque gems, by the introduction of treatments, imitations, and synthetics. The finest of Turquoise reaches a maximum Mohs hardness of just under 6, or slightly more than window glass. With lower hardness comes greater porosity. The luster of turquoise is typically waxy and coloring can range from white to a powder blue to a sky blue, and from a blue-green to a yellowish green. Despite its low hardness relative to other gems, Turquoise does take on a good polish. It can also be peppered with flecks of Pyrite or spidery Limonite veining. It should be known that most Turquoise is not the genuine article. While statistics vary, there’s no denying that Turquoise—whether it’s dyed, painted, enhanced, stabilized, impregnated with plastic or resin, or synthesized altogether—is an attractive stone to imitate. The most common total imitation of turquoise encountered today is dyed Howlite and Magnesite, both white in their natural states, and the former also having natural (and convincing) black veining similar to that of turquoise. If you want the look but not the price, we carry some lovely imitations (fully disclosed) that will be sure to satisfy your Turquoise needs! Check out ’em out below! Howlite Slabs, 6mm Round Jasper, Faceted Jasper Rondelles, Jasper Heishi, Faceted 12mm Round, Faceted 10mm Round. Today, Turquoise is mined chiefly in Iran, Afghanistan, China, Australia, Chile, Mexico, in addition to the states of the American South West with Arizona and Nevada being two of the leaders there. In recent decades it has been increasingly popular among the Hollywood elite and continues to be quite a trend in Germany and Japan. If you DO want the real thing – we carry some lovely genuine Turquoise 4x8mm polished chips that have a beautiful finish on them! If you’re a believer in the metaphysical properties of stones, Turquoise is considered among the crystal healing master stones. According to New Age followers, its healing powers are thought to benefit the whole body, with special strengths in aiding ailments of the immune, respiratory, waste, and skeletal systems. 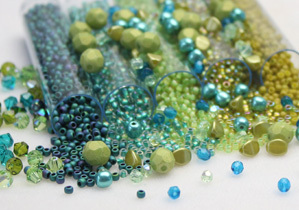 Want to see everything that Eureka Crystal Beads has to offer in this color family? Check out this “Turquoise” search from our website to see pages and pages! I’m also going to pull out some of my favorites and feature them belor for you! Previous Post DECEMBER BEAD CHALLENGE!